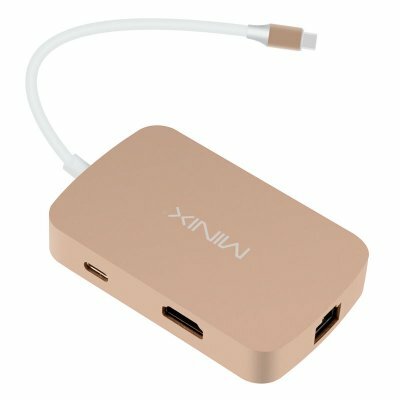 Successfully Added MINIX NEO C Type-C Multiport Adapter - HDMI, Gigabit Ethernet, 2 x USB Type-A, SD + Micro SD Slot (Gold) to your Shopping Cart. With a stylish build and slim profile this handy adapter comes n the same gold color as the MacBook range, complimenting the unique design of your MacBook while expanding its connectivity. This USB-C Multiport Adapter from MiniX lets you unleash the full potential of your MacBook. With 2 USB type A, HDMI, Gigabit Ethernet storage card support this USB type C multiport adapter brings superb connectivity and backwards compatibility to your Mac. The pocket sized adapter lets you connect to several devices while simultaneously charging your MacBook. An HDMI output means this multiport adapter lets you connect a projector or large screen to your MacBook and with 4K support the resolutions are sure to impress. Alternatively hook up your Ethernet, Mouse and Keyboard to make a complete compact docking station suitable for home or office. This adapter removes all the barriers of the MacBook's single USB Type-C port by brining backwards compatibility to USB type A devices as well as offering support for storage devices and the ability to hook up an additionally monitors, this will make multitasking easier and make your work much more efficient. The MiniX Multiport Adapter comes with a 12 months warranty, brought to you by the leader in electronic devices as well as wholesale adapters and USB gadgets.. Prior to using the Gigabit Ethernet port you must download and install the necessary drivers on your MacBook, These can be obtained from the link in the user manual.